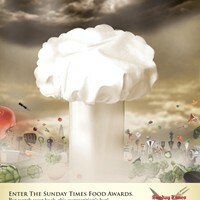 This campaign won an International Newsmedia and Marketing Association (INMA) award in 2011 and generated a massive increase in sales, putting The Times on the map as one of the biggest selling daylies in South Africa.The Times Newspaper offers busy people a quick read of the essential news. 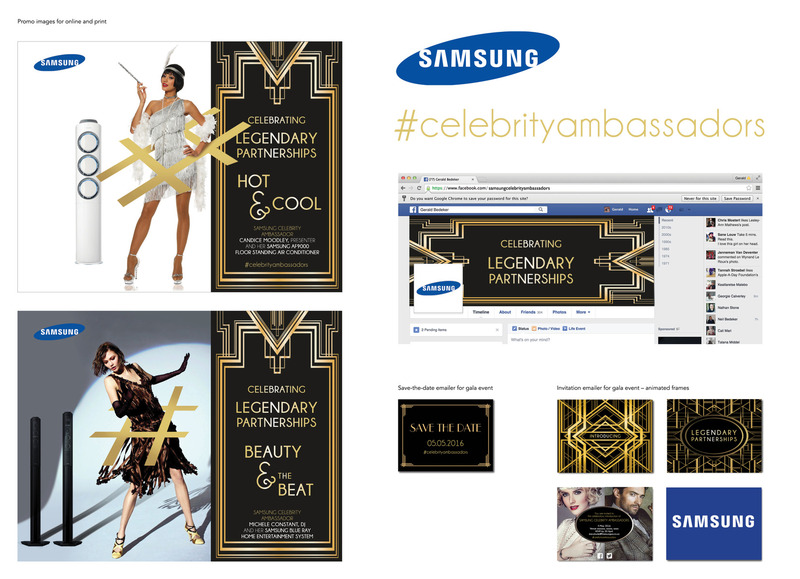 To introduce Samsung SA’s celebrity ambassadors to the media and partners, a stylish event was organised in the theme of ‘The Great Gatsby’, a famous American novel set in the 1920s. 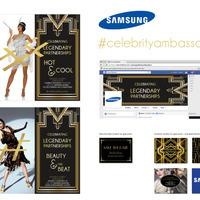 The hashtag #celebrityambassadors was created for use on twitter and facebook to create hype about the upcoming event and the partnership between the ambassadors and Samsung’s various product categories. The partnering of Samsung with well known local celebrities creates a strong and appealing partnership to be reckoned with. 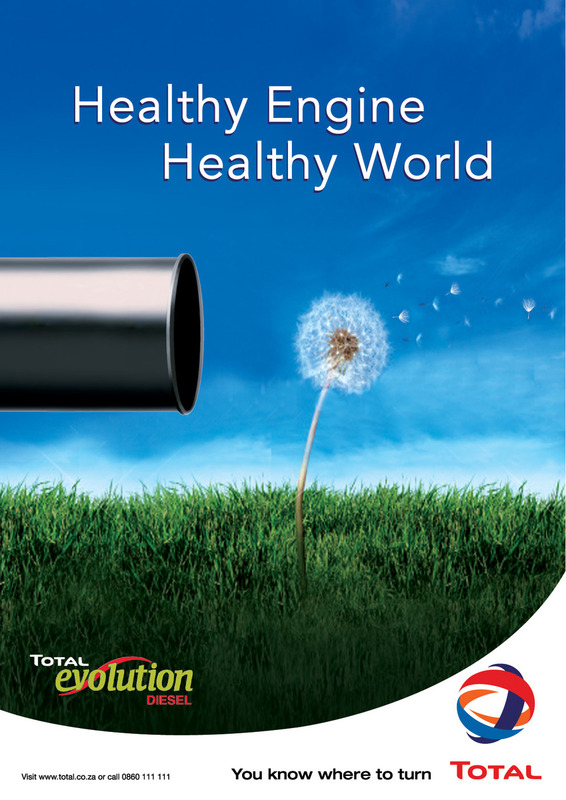 The best of both worlds come together – technological innovation meets individual star quality. 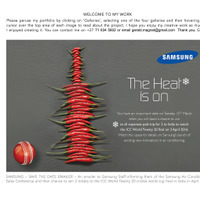 The result is a convincing brand spokesperson to whom their favourite Samsung products are an extension of themselves. 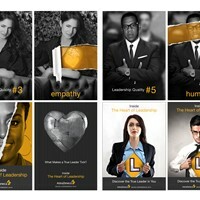 Each celebrity has outstanding and appealing qualities that resonate with and enhance the appeal of specific Samsung product benefits – lending a believable authenticity to all communication. The creative visual delivery embraces the theme and style of The Great Gatsby, thereby giving the event a timeless elegance and star quality that speaks of legendary partnerships in the making. 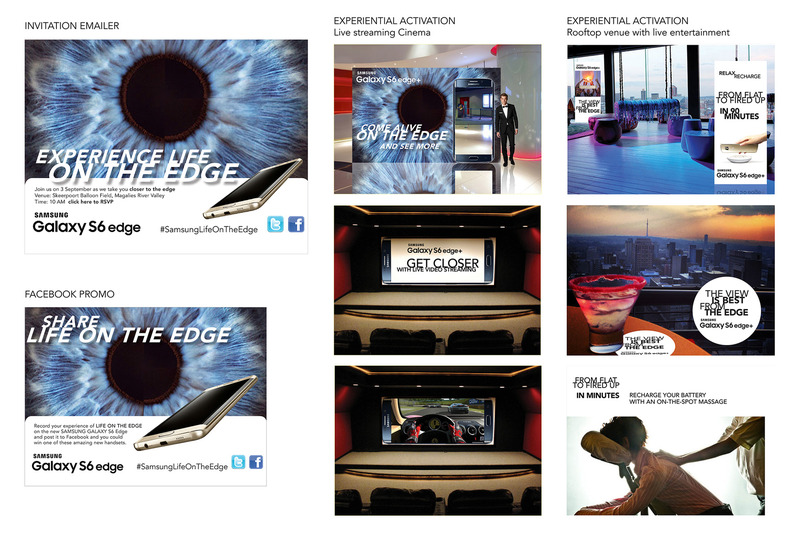 To demonstrate the exciting features of the Samsung galaxy S6 Edge to the media, an experiential event was developed as pitch proposal to Samsung. LOVE THE VIEW: The larger dual-edge display is more than beautiful. 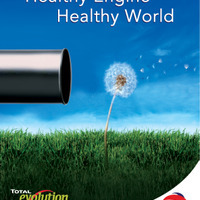 It lends depth to your movies, breathes life into your games. 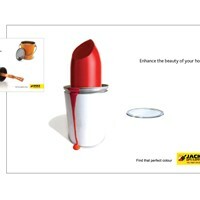 There's room for you to experience more, feel more. 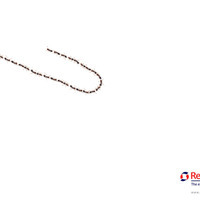 SHARE REAL TIME: Celebrations are meant to be shared. Stream the fun straight from the camera with Live Broadcast. BETTER ACTION: Take full advantage of the stunning Quad HD Super AMOLED (518 ppi) dual-edge display for a realistic gaming experience. 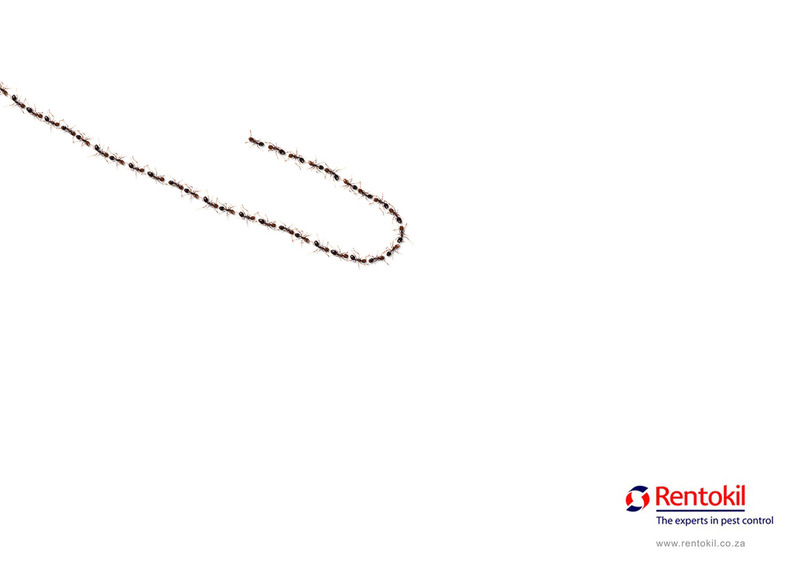 CHARGING: You can’t risk running out of power when there’s so much to say, watch and do. We gave Galaxy S6 edge+ the long battery life you need. 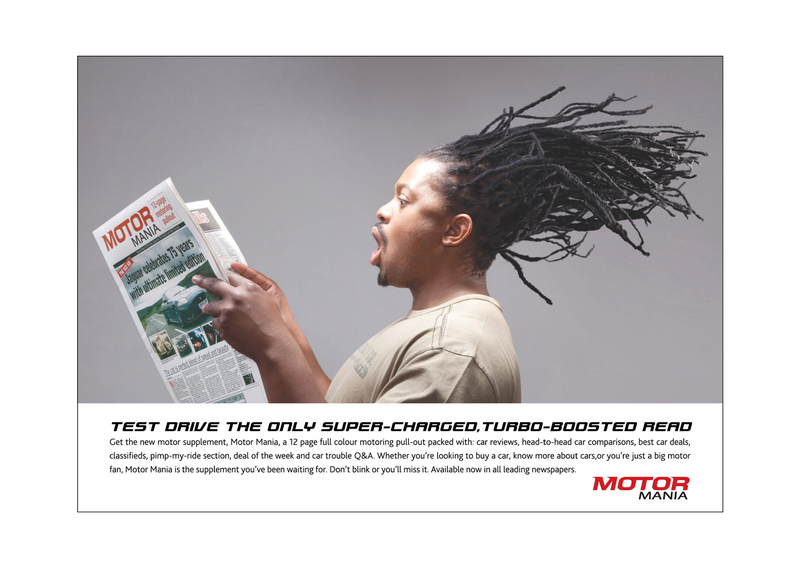 And fast charging power, uninterrupted. Even without a cable. 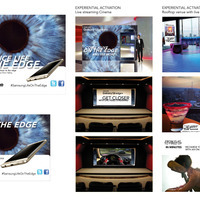 To bring the experience of the phone to life, A private cinema is set up where delegates are invited to step through the screen of the phone and into a private cinema. The cinema screen is a large Galaxy s6 Edge screen on which live action is streamed in real time, demonstrating the image quality, action and live streaming capabilities of the phone. 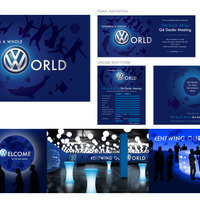 after the cinema, delegates are transported to the race track to experience the action for themselves. The event is concluded with cocktails at a rooftop venue where the 'view from the edge' in literally brought to life. The fast charging feature of the phone is given a delightful demonstration by offering delegates on the spot massages by professional masseuses. 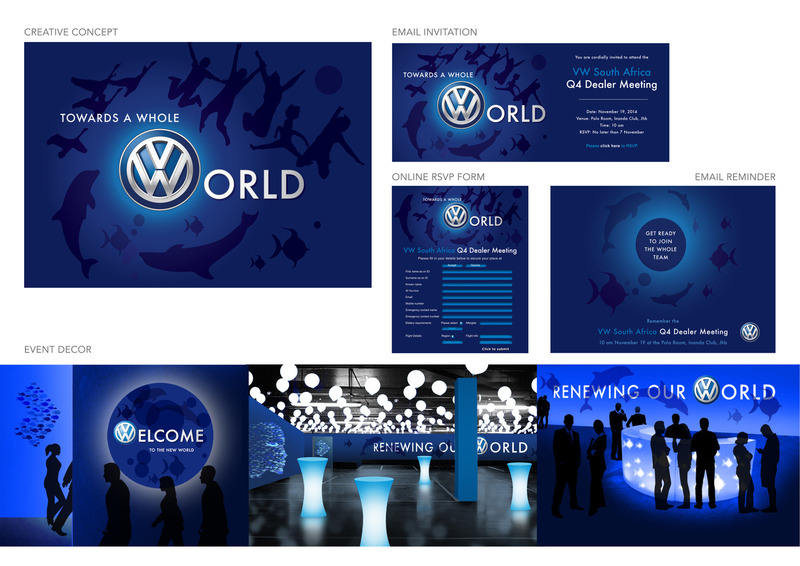 The underwater ocean theme and main slogan for the event – ‘Towards a whole world’ – encompasses Volkswagen’s goal to be the most responsible and innovative volume car brand in the world and their vision of transformation. 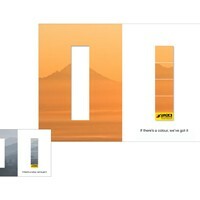 As part of TBWA Hunt Lascaris Cape Town’s winning pitch, I was tasked to create a new logo and launch campaign. 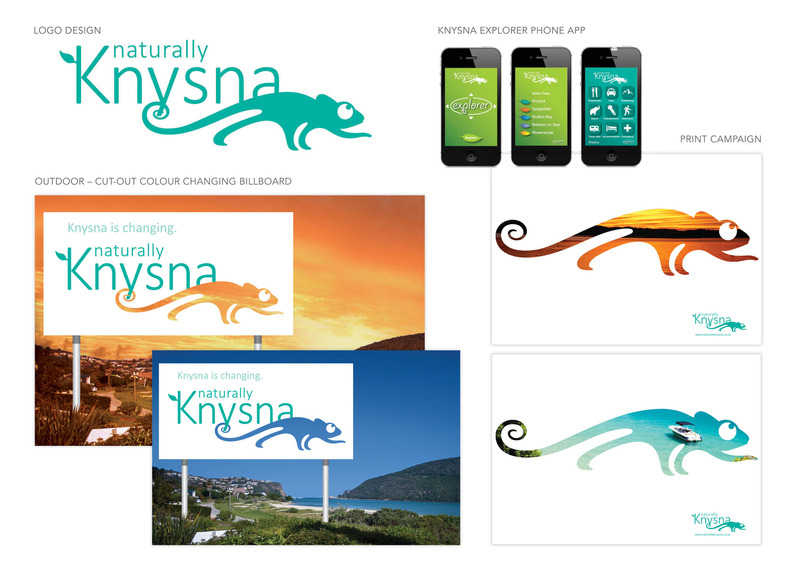 I chose a small but incredible resident of the Knysna area as focus for the campaign – the Knysna Dwarf Chameleon. 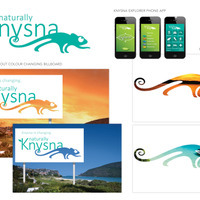 An endangered creature found only in the Knysna area, it represents awareness, exploration and protection of this incredibly beautiful natural treasure. 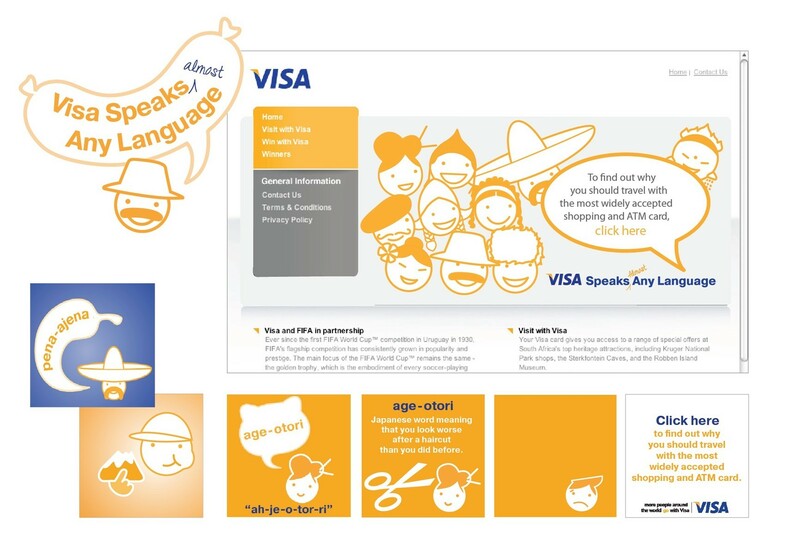 To introduce VISA’s ‘cross border’ card services, I created a range of characters representing various nationalities to explain the benefits of using a VISA card when travelling in an interactive way. 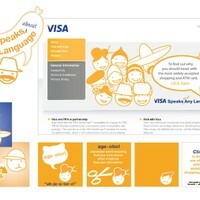 The characters were then animated for use in web banner ads and videos on the VISA site and elsewhere. 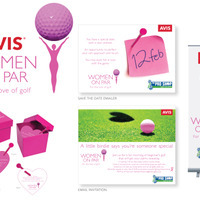 I collaborated with Event Organisation in Johannesburg to promote AVIS to a selected group of respected businesswomen by means of ladies' golf days in Johannesburg and Cape Town around valentine's day in support of breast cancer awareness. 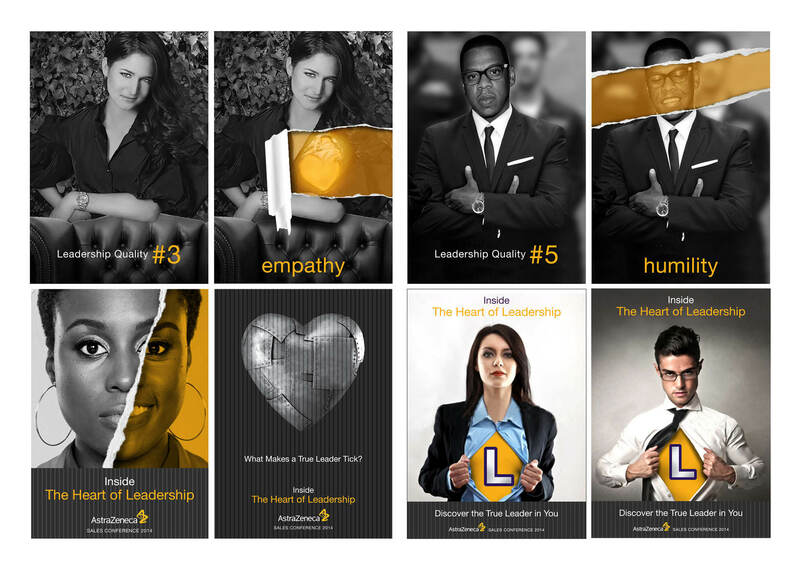 To create awareness and hype amongst staff about the upcoming sales conference and the theme, Leadership, an intriguing and striking campaign that gets to the heart of the matter was created. 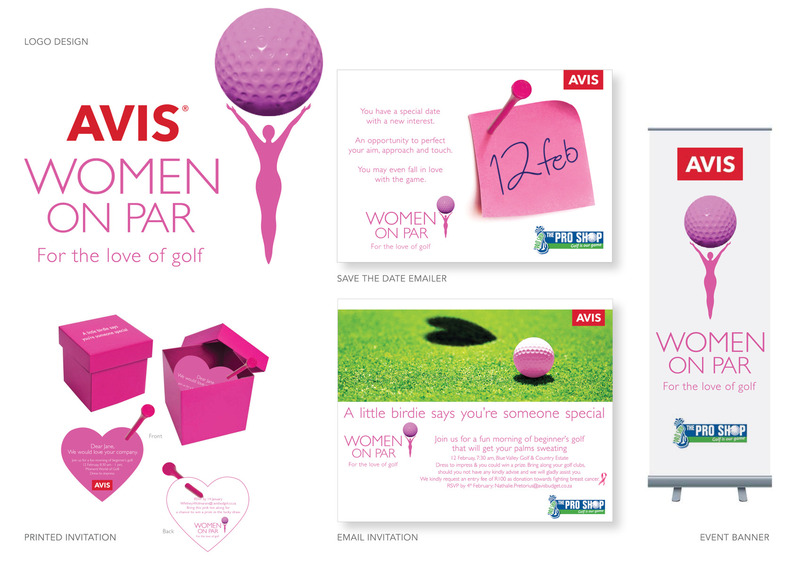 This is one of 2 campaigns created for Event Organisation and pitched at AstraZeneca, successfully securing the business. 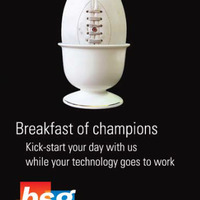 BSG makes computer systems work better, harder and more efficiently. Like a well oiled machine or a winning team. 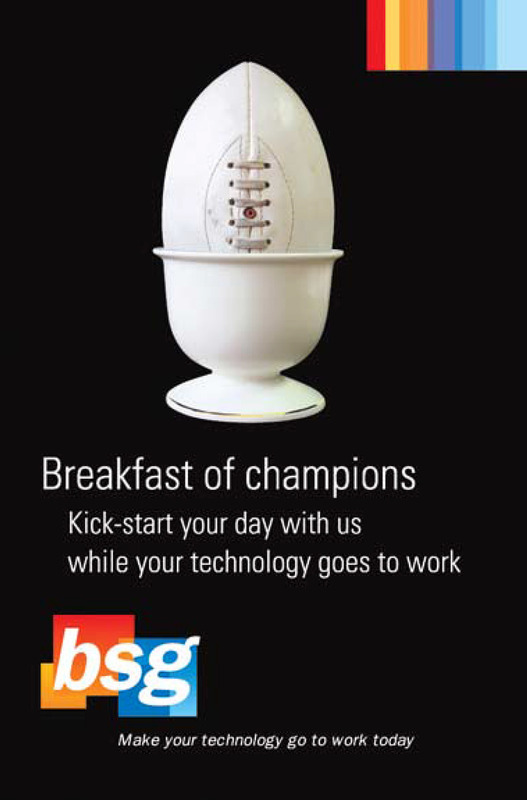 They chose to host regular business breakfasts for potential clients, always featuring respected guest speakers – in this case the World Cup winning Springboks upon their victorious return from France. 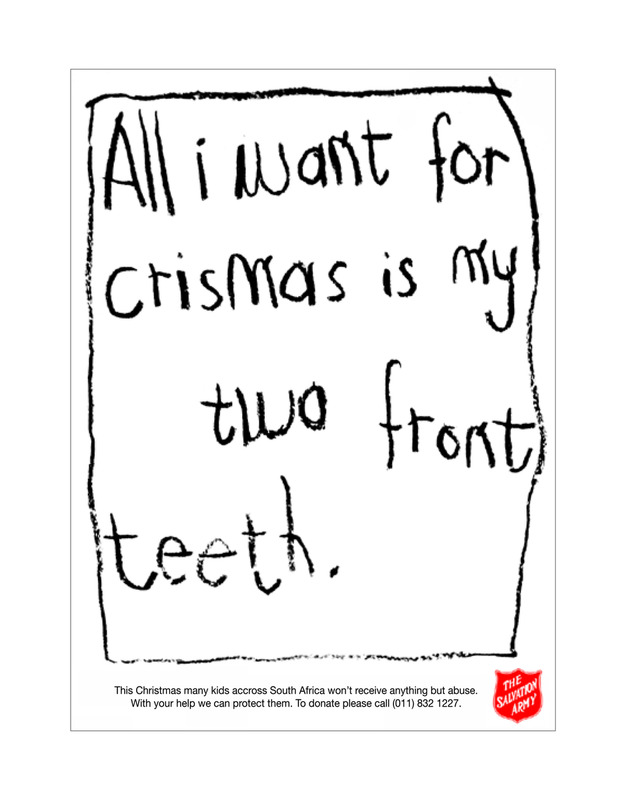 This print ad for the Salvation Army was awarded Silver Quill ad of the Month by Natal Newspapers when it appeared. 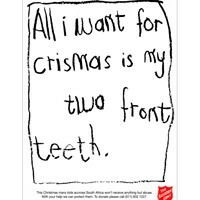 The ad was run over the December Festive period to raise awareness of child abuse and funds for the Salvation Army and their tireless charity and welfare work. 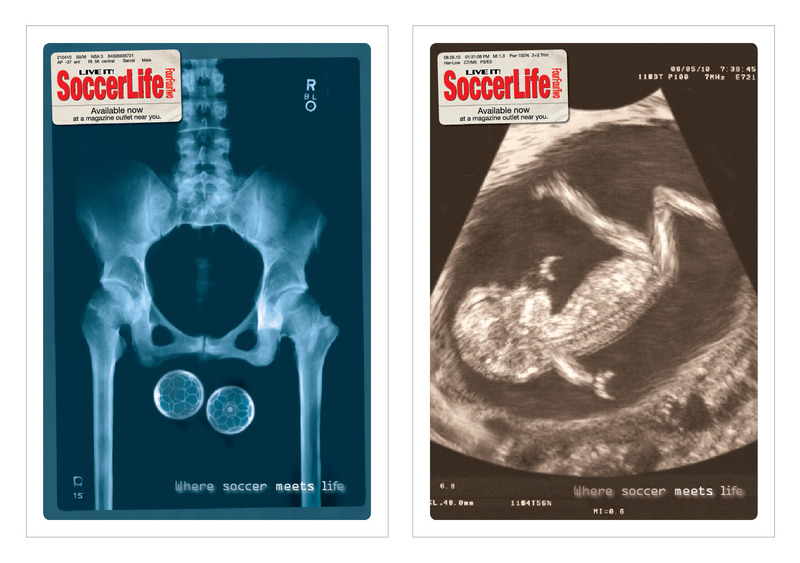 To attract the attention of those with soccer in their blood, x-rays were created to reflect how deep the love of soccer goes in the readers of this niche magazine. 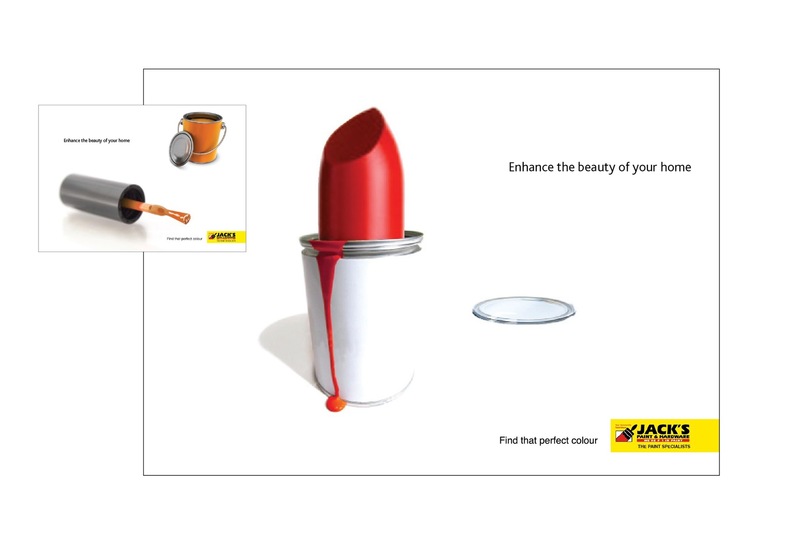 To position Jack’s Paint as the paint specialist of choice, a paint tin is given an eye catching make-over to catch the eye of the female market. 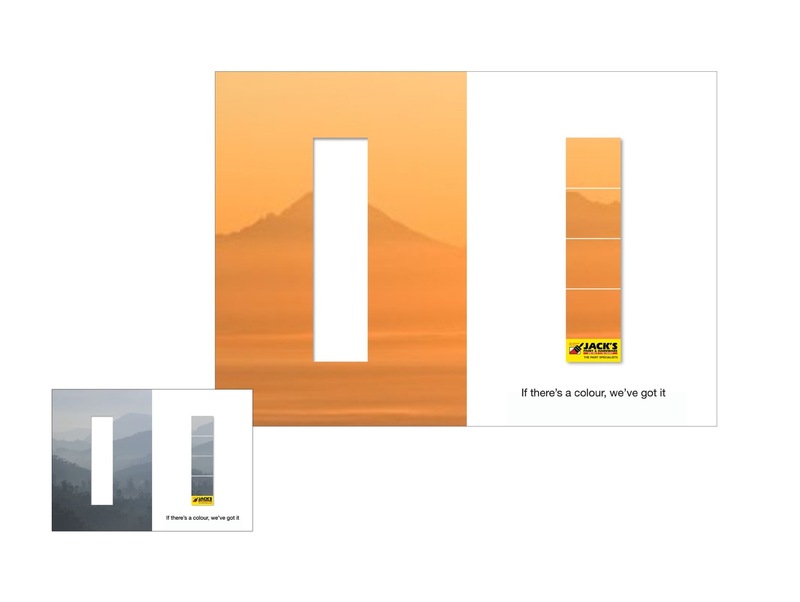 To position Jack’s Paint as the paint specialist of choice, the varying colours of landscapes are used to make up the familiar paint swatches. 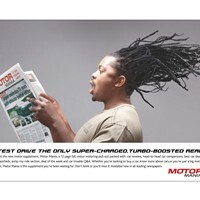 By creating a simple but arresting image we captured the excitiment of this newspaper supplement for car lovers. 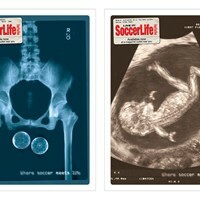 Once you get into it, you won’t want to stop. 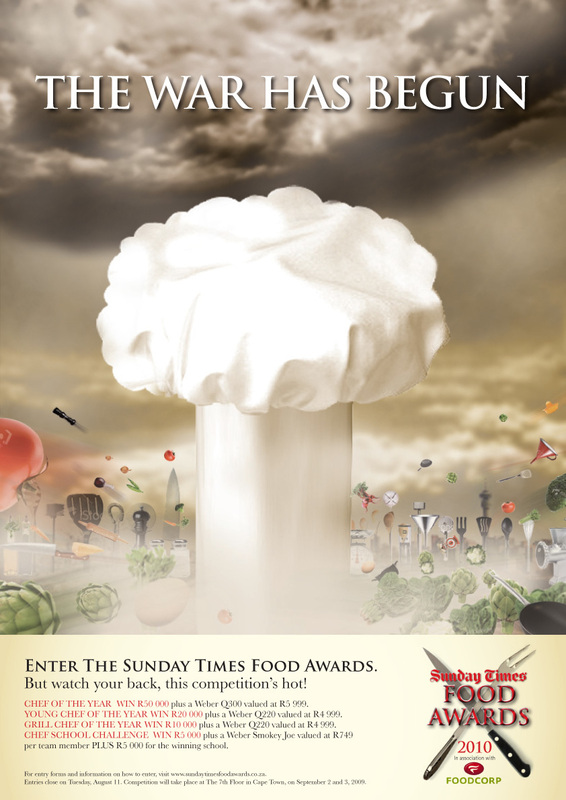 To announce the toughest chef’s contest in the country, a chef's hat explodes amidst flying kitchen utensils and food as the cullinary battlefield lies in wait. 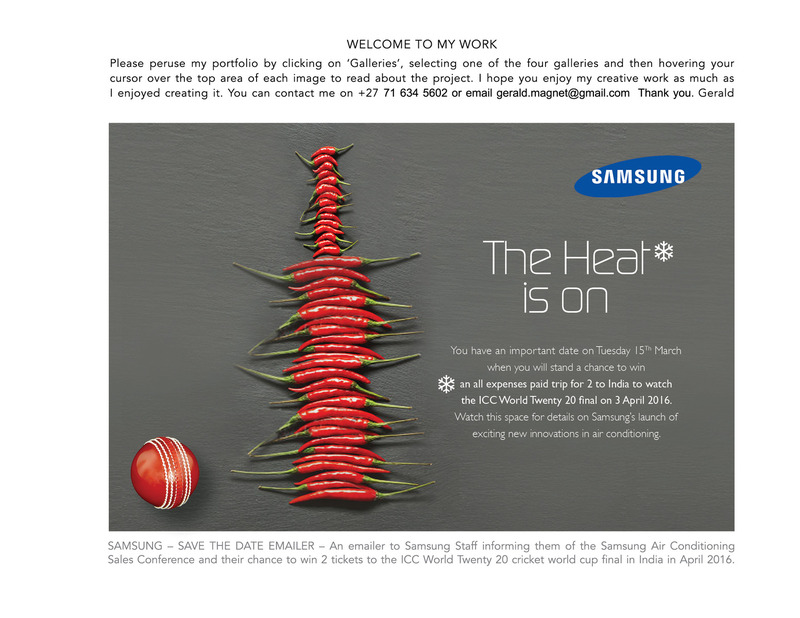 As part of the creative communication designed for this event, I created this emailer to Samsung Staff informing them of the Samsung Air Conditioning Sales Conference and their chance to win 2 tickets to the ICC World Twenty 20 cricket world cup final in India in April 2016.